You're a smart, successful professional with knowledge and experience to share with audiences. From team meetings to conference speeches and panels, you should be a natural at speaking dynamically. So why are you struggling with performance anxiety? Whether it's a long-standing problem or a new issue, stage fright can erode your peace of mind, undermine your confidence, and keep your voice from being heard. It may even be holding you back professionally. It may seem like a mystery as to why you're experiencing it at all. But overcoming fear of public speaking is easier than you think! What you need is a program that combines a deep understanding of stage fright with a laser focus on effective performance. I'm okay speaking to small groups, but experience anxiety in front of large audiences. I've been presenting for years, but always with a great deal of fear. I have terrible stage fright, sometimes for days or weeks before I have to speak. As a CEO, I'm suddenly dealing with performance anxiety I've never experienced before. I seem to have lost my edge, and I find myself wondering if it's going to get worse. I avoid speaking situations, and my boss is noticing. My heart feels like it's going to leap out of my chest, and I forget to breathe! I've had moments of panic recently, and now I'm afraid it's going to keep happening. I want to communicate without the crippling fear taking over my life. I had a bad speaking experience, and now I keep worrying it will happen again. Fear makes me lose my train of thought. At times, I'm afraid I'll go completely blank. I think I need help with both my fear and my ability to perform with excellence. Conquer your stage fright at last! If you suffer from speech phobia, it's not because you don't know your stuff. Even famous performers and powerful executives can and do suffer from debilitating nerves. As an actor and speech coach, I based the Fearless Speaking System on theater-based techniques that are the best that exist for this problem. I use a holistic approach that combines psychology, a focus on the body and breathing, mindfulness, and skills for powerful stage presence. Learn how my revolutionary approach will help you take action to overcome your fear while performing at your best! Contact me or call my office at (617) 993-3410. I'll be delighted to tell you more about my Fearless Speaking coaching and how it can help you. You'll also receive recommendations for continued improvement. Additional resources include my blog Speak for Success!, where you'll find over 30 articles I've written on overcoming fear of public speaking; my monthly newsletter; and our page Dr. Genard in the Media. 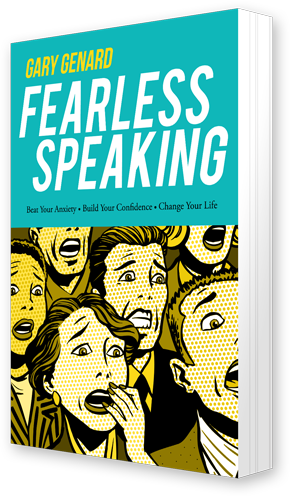 A self-guided program to conquer your fear of public speaking.